Posted in: St. Louis Cardinals. Tagged: Bogg, Cardinal, Joe Kelly, Major League Baseball, Martinez, Mitchell Boggs. A couple weeks ago I wrote about Carlos Martinez, you can check it out here. The time has finally come. Last night Martinez made his MLB debut and pitched a scoreless inning in a 6-1 victory of the Brewers. Check out his scouting report in the link above. This kid is legit. 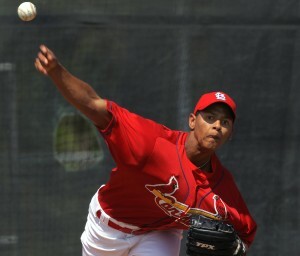 Rated as the Cardinal’s number 2 pitching prospect, Martinez started the year in AA Springfield. I had planned to go see him start, but I can live with this. This year in Springfield he has pitched 11.2 innings giving up 3 earned runs and just 1 walk. In his starts he has consistently hit 98 on the gun with movement. As you saw last night he’s got himself quite the curve ball. But the Cardinals, once again, needed to get a new power arm in the back of the bullpen to stabilize it . Corresponding with this move the Cardinals used up Bogg’s last option to Memphis. I expect Boggs to figure it out and get back here soon enough. He was just TOO dominate last year. Where’s Micheal Wacha? I have a feeling that the front office REALLY wants to groom him as a starter and doesn’t want to touch him. Just look at what a bullpen move has done on Joe Kelly, he’s still struggling to get his ERA UNDER TEN. So the Cardinals annual bullpen shuffle continues. Only this time, Mozeliak has some toys in the farm system to call upon.